Round lidded baskets were not nearly as common as open baskets and one with two handles and a woven lid was rare. This basket is one of a kind and an esthetically pleasing copy of a circa 1860 to 1890 work basket. The use of old cane gives it a naturally aged mellow nut patina which cannot be achieved with stains. It does however have more of the sturdiness of a new basket. Jane splits her basket making time between historical reproductions using recycled materials as is the featured basket, and traditional new baskets. 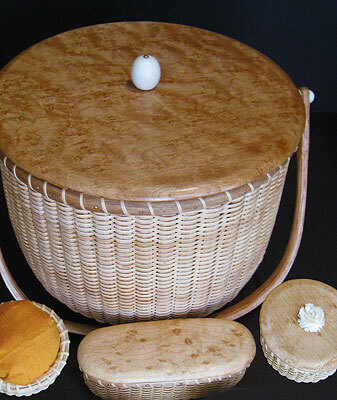 She also makes Nantucket style baskets with visual pleasure but contemporary uses. As the original “Nantuckets” were made for everyday use she believes it is possible to still mesh beauty with function. All molds rims and handles and now some scrimshaw is done by the artist. This allows for the continued ability to fashion special requests and continue her artistic growth. Jane’s mission continues to be to offer the continued functional beauty of the traditional Nantucket style basket to be used and enjoyed.